​Growing up on a cattle ranch in the South West Texas Panhandle didn’t hurt. Says Littlewarrior, “I could stand in the middle of the yard, turn a complete circle and see nothing but horizon in all four directions! This made a very large space for listening and talking to Creator and Mother Earth.” At 15, when Nadiya moved to San Angelo, Texas to live with her maternal grandparents, Mr. & Mrs. John O. Whipple, a Potawatomi woman and a Cherokee man…these grandparents instilled in her the importance of a thoughtful, discerning life. Her paternal Grandfather, Bird Buzan, was a full blood Native man born on a reservation in Kansas, was believed to be Sauk/Fox. Nadiya studied art academically in Texas, Oklahoma, and California as well as private studies with various artists. 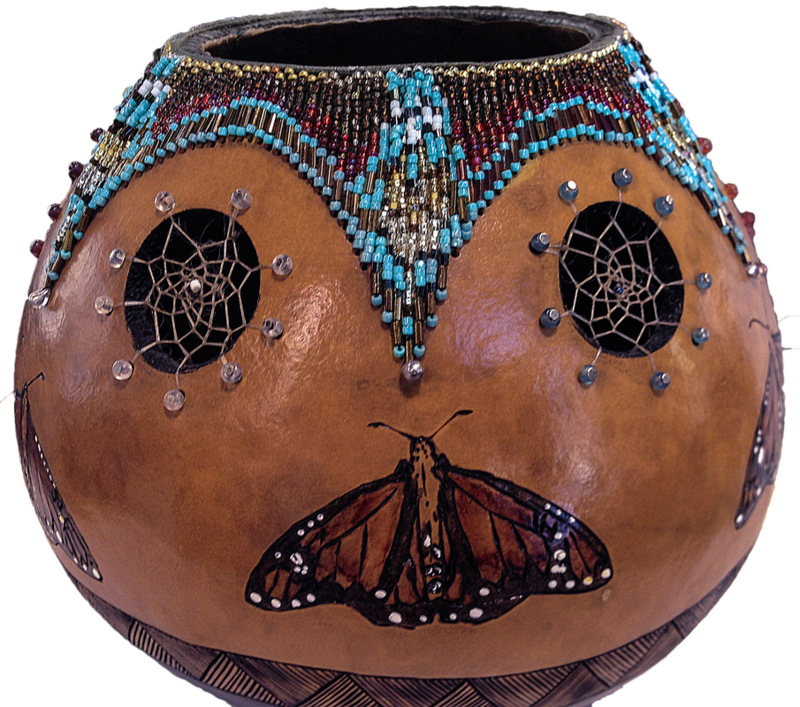 Six times her people of the Citizen Potawatomi Nation have honored this award-winning artist, known for her gourds around the world. She has been invited and accepted to exhibit her art at the following prestigious locations: Southwest Museum, Antelope Valley Indian Museum, Satwiwa Native American Culture Center & Museum, Mallard Sheets Gallery, William S. Hart Park & Museum, The City of Lancaster Fine Arts Museum and the Haramokngna Culture Center. Both the Southwest Museum and the Gene Autry Museum of Western Heritage have sold Nadiya’s art in the museum gift stores. Nadiya has also been a guest speaker at NASA on two occasions, the Autry National Center, Southwest Museum, Antelope Valley University, Santa Clarita Artist Association and the Daughters of the Indian Wars, Pasadena Chapter. 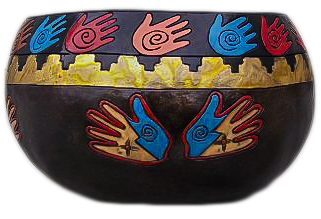 Her husband, John Davis inspired the name of her company, SPIRIT VESSELS STUDIO, reminding her that the best way to come up with a name would be to dream on it, as her ancestors did. 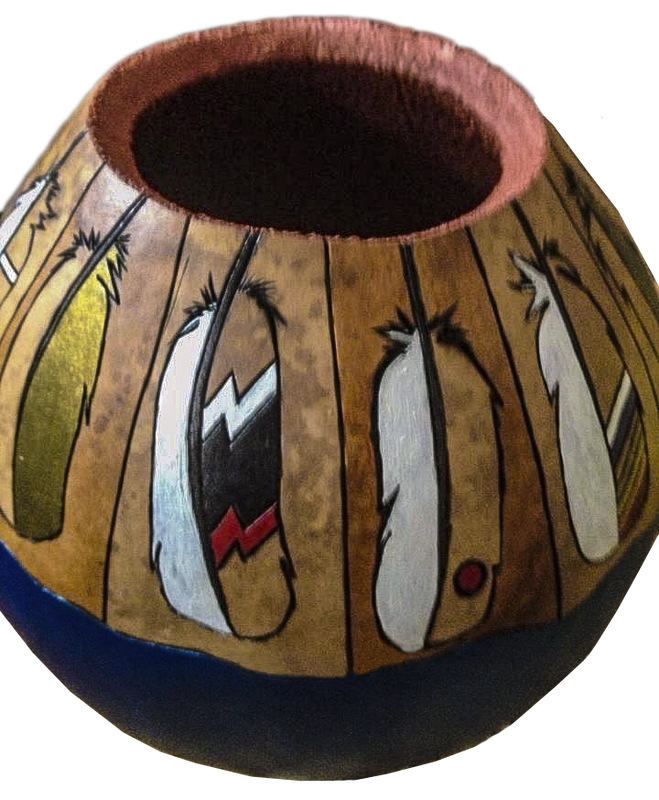 Nadiya says, “They are Spirit Vessels to me because The Creator makes the Gourd People and puts their spirit in them and I get to dress them with regalia.” Spirit Vessels was dreamed into being in 1993. With a history in art and a distinctively Potawatomi /Cherokee heritage, Nadiya Littlewarrior is one of today’s most dedicated artist’s of contemporary Native American Art. Her collectors span the world from China to Spain and include such people as Dr. Joyce Brothers, screenwriter Lisa Atkinson, actress Jennifer Tilly and actors Dennis Haysbert & Troy Evans. LA Treasures Program Awarded by the City of Los Angeles Cultural Affairs Department and The Los Angeles Folk Art Museum: 2004 Grant awarded to teach & have a one woman show. California Traditional Music & Arts Society: 2005 Grant awarded to teach and hold special events. 2008 Grant awarded to teach spring classes at UAII's Central High School and prepare them for Annual Autry National Center Art Exhibit. Curator for Title VII Student exhibit. 2009 & 2010 Grant awarded to teach at risk children in the Phoenix House of Los Angeles that houses at risk teenagers. NASA Armstrong Flight Research Center HONOR for Arts & Leadership in American Indian Community November 12, 2015. 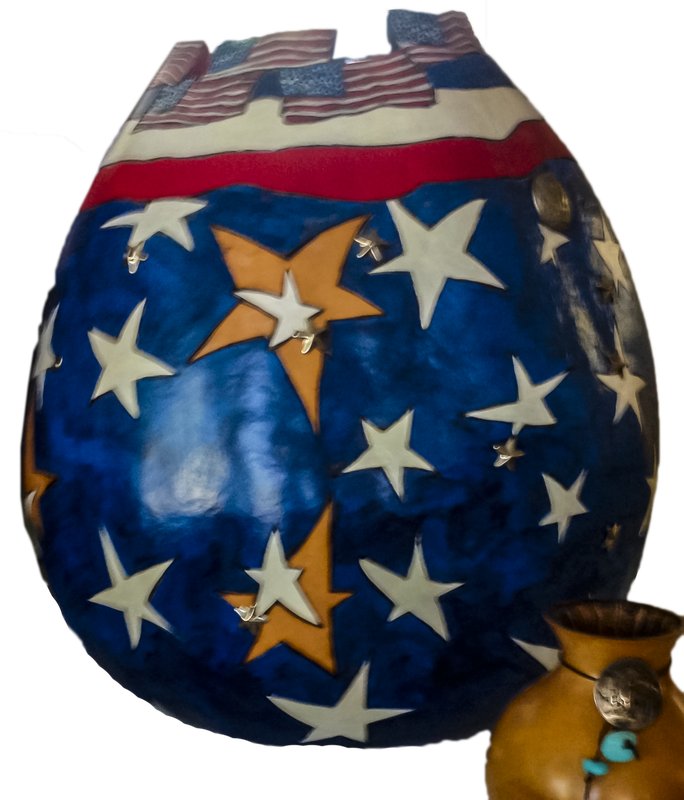 Digital enhancement;gourd art photo entitled:"Tears for the Old Ones"
All Roads Art Market, National Geoographic Film Festival, 2005 in cooperations with Native Voice at the Autry National Center. NPS owns and rotates seven original art pieces with video interview.